This is perhaps one of the most unusual aircraft I’ve had the privilege of photographing and it also happens to be one of my favorites. No matter how many times I’ve seen this plane fly or how boring the skies are photographically, I will always raise my camera for this plane. 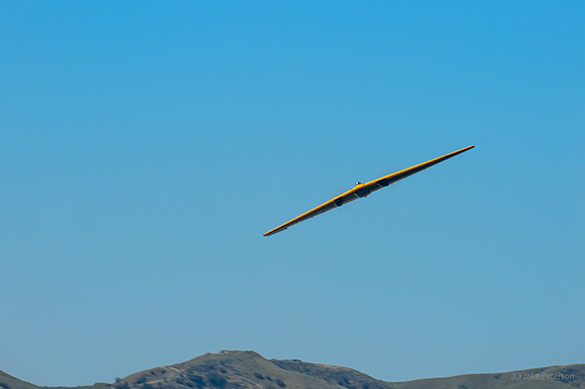 This is the N-9MB Flying Wing, built by Northrop and is one of four prototypes built and is the only left today. Jack Northrop started working on all wing designed aircraft in 1929 and the N-9M was the third in the lineage. It was one third of the size at 60ft long and the M standing for model. The N-9M was used as a test bed for the XB-35 and YB-35 heavy bombers. The preliminary order for the B-35 came in October 1941 and it included the 1/3 scaled model for testing and familiarization of pilots with the all wing design. In December 1942 the first N-9M flew. In 1943 an order was placed for three models and a fourth one was added on after the first N-9M crashed. They were designated N-9M-1, -2, -A, -B. Most of the air frame and skin were made out of wood with some steel tubing inside. Three of the models used the two 290 hp (216 kW) Menasco C6S-1 inverted air-cooled straight-six engines and driving twin-bladed propellers. The N9MB, the only one left, used two 300 hp (224 kW) Franklin XO-540-7 engines. Northrop test pilot John Myers was the first to fly the N-9M on December 27th, 1942. Over forty five test flights were flown with most being cancelled due to mechanical issues with the Menasco engines. The original N-9M crashed on May 19th, 1943 killing the pilot Max Constant. 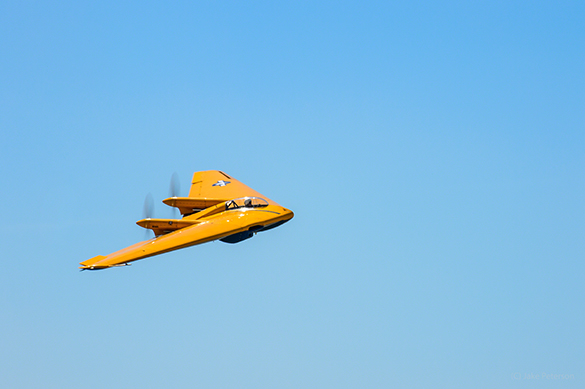 When the Flying Wing Bomber program was cancelled all the prototypes were destroyed except for N-9MB. The research data gathered from the N-9M and B-35 were used however to develop the B-2 Spirit Stealth Bomber which entered service in 1989. Today the N-9MB is housed at the Planes of Fame Air Museum in Chino, CA. It is frequently in the air giving demonstrations for the masses at airshows. It is by far one of the quietest aircraft I have ever come across and at a distance in level flight, even with it’s bright paint job, it does disappear. 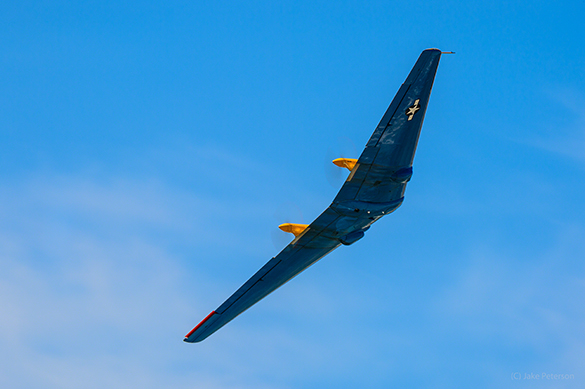 Thanks to the help of many volunteers this important piece of aviation history lives on.